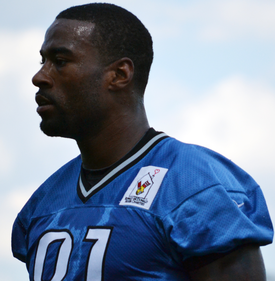 Calvin Johnson (born September 29, 1985) is a American football wide receiver played his for the Detroit Lions. His nickname is Megatron. He was drafted by the Lions in 2007. He was also on the winless 2008 Lions roster. Even though the Lions went 0-16, Johnson finished as one of the strongest wide receivers statistically for the season, fifth in receiving yards (1,331) and 7th in receiving yards per game (83.2), and leading the league in receiving touchdowns (12). At the end of 2015, Johnson retired. This page was last changed on 29 June 2016, at 15:25.